Italian Ricotta Cookies recipe are incredibly soft with a tender texture, delicious, and absolutely perfect for any holiday, not just for Christmas. 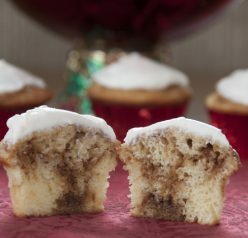 They will be a new favorite holiday tradition and everyone will ask you for the recipe! These cookies have been done a million times and in a million ways before, but this is my own personal take on them and what I think tastes the best! Mr. Wishes’ Grandmother used to make all of the Italian cookies for each of the holidays before she passed away. I like to keep her traditions alive which is why the past few years I have tried my hand at more Italian holiday cookies (like these Italian Anisette “S” cookies) and even her Italian lasagna recipe! Most of you probably have had Italian Ricotta Cookies at one point in your life whether you are Italian or not (if not, I’m sorry you have been so deprived). They have more of a cake-like consistency and are not dense like you would normally expect in a cookie. I can never have enough of these bad boys! The best part is that you can make them for any holiday: color the icing to match the holiday you are making them for and switch up the sprinkles however you want. Isn’t that just the best? These cookies are so good that I’m willing to get fat for them. Heck, that’s any Christmas cookie. Who am I kidding? Enjoy! 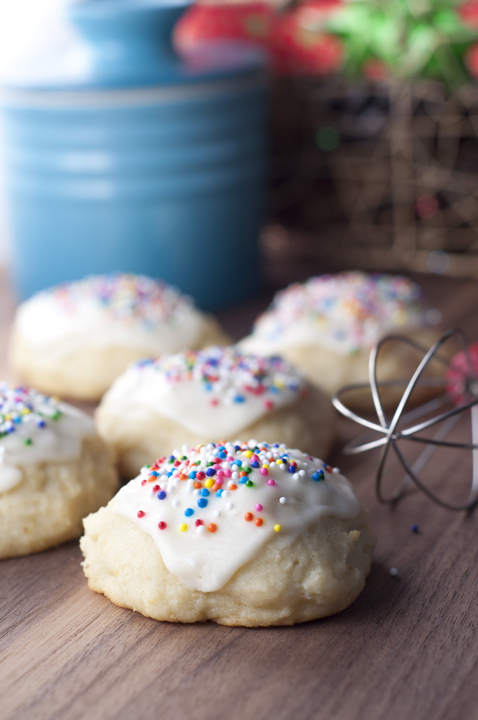 Check out my how-to video of me making the recipe for these Italian Ricotta Cookies! 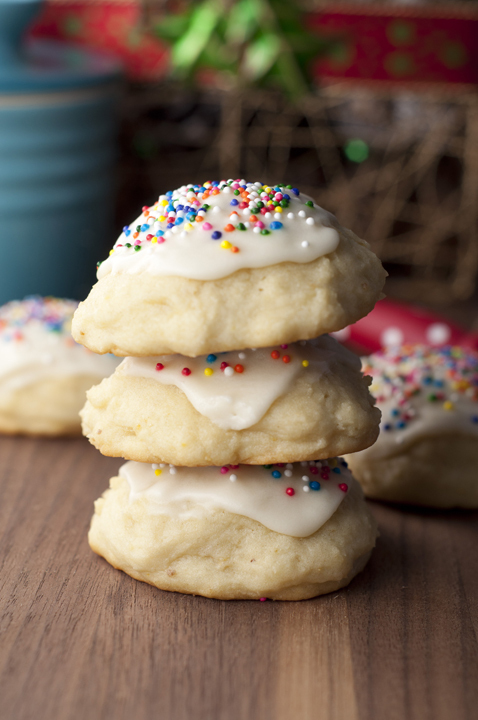 Italian Ricotta Cookies recipe are incredibly soft with a tender texture, delicious, and absolutely perfect for any holiday, not just for Christmas. In the bowl of an electric mixer, cream together butter, sugar medium speed. Add eggs and beat those in, as well. Add Ricotta cheese and mix until smooth and fully incorporated. Add vanilla extract and orange zest and blend. In a separate medium bowl, whisk together flour with baking powder, baking soda and salt. Gradually add the flour mixture to the wet ingredients (one cup at a time) on low speed until a dough is formed. Drop the dough by heaping tablespoons onto an ungreased baking sheet (they will puff up while baking). Bake for 10-12 minutes (this will depend on size of cookies and your oven so keep an eye on them). Cookies will just be started to get lightly golden around the bottom edges. You want them to remain soft and not get too over-baked. Remove from baking sheet and place on a cooling rack to cool completely before putting on the glaze. Spoon glaze onto cookies, add sprinkles of your choosing before glaze dries, and allow it to fully set before storing. Mix together melted butter, powdered sugar, heavy cream, vanilla extract in a bowl until smooth and no lumps remain. Add additional splashes of milk or cream to get the desired consistency. You don't want it to be so thick that it's not spreadable, but also not too runny. I am so deprived! 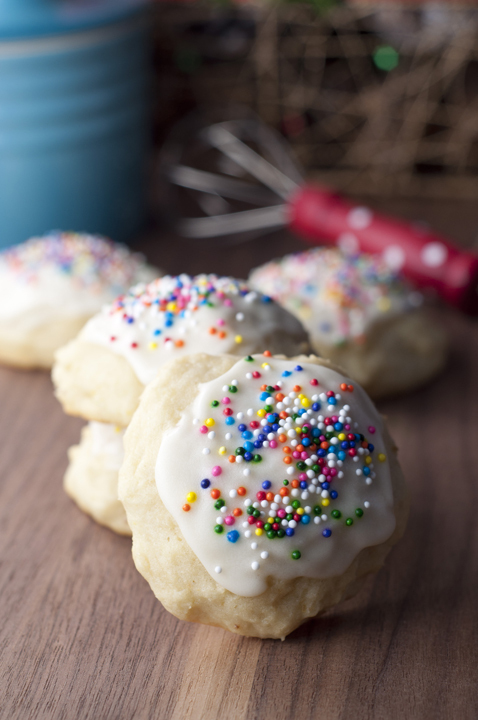 I have never had Italian ricotta cookies – that I know of! These look so pretty!! Love them. Mom used to make them …. awesome. Especially with espresso !!! Mmm Yumm…these look fabulous Ashley! So soft and decadent! Oh these just make me think of home! We always had these growing up! I need to make some myself! Love ricotta cookies! We make them every year with the kids and they bring back so many childhood memories!! Yours are so pretty, Ashley! our family has a version of these too! I love these! Such a great texture with all that ricotta! So, I’m totally in love with the glaze and little sprinkles on these! I love that you’re keeping your husband’s grandmother’s traditions alive! I think keeping traditions alive like that are so, so important! These sound so delicious — I am trying to figure out if I’ve had them before or not. But either way, I want to try making them! I can’t believe with all of my Italian friends that I’ve never had a ricotta cookie. I used to live near a sweet Italian grocery store that baked ricotta cookies daily, but I never did try them because I couldn’t see beyond the canoli and fresh bread! I’ll have to give these a whirl, if for no other reason that to play with the sprinkles. 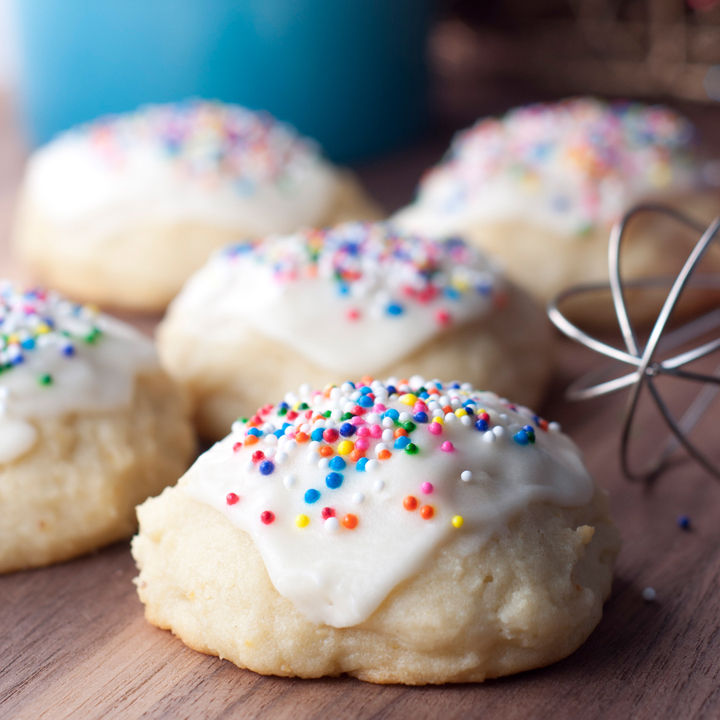 Oh, how I love Italian ricotta cookies! So moist and soft. So good! I wasn’t able to find any full fat ricotta, is part skim ok? And also, with the orange zest, the recipe says “orange zest or fresh” what is the or fresh part? Hi! Yes, the part skim will work fine! By the orange zest – you can buy it in the spice aisle dried or you can use fresh orange zest that you actually grate yourself with a zester 🙂 I have done it both ways before. Yeah they sell orange zest and lemon zest! I have used it before when I’m in a hurry 🙂 I don’t ever notice a difference in taste. Sorry for the confusion! Ashley, I must try these! I have no cookie recipes from MY Italian grandmother,although I make my mother’s cookies often. 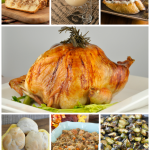 Thanks so much for posting and introducing this delicious recipe to so many that may have been deprived if not for you. I was wondering if these freeze well. If so, would you recommend adding the glaze before freezing or after defrosting? I froze these and have to be honest that they were way better fresh! They were still good, but a little more “wet” texture. I would make the dough and freeze it before baking…and also you can make the glaze and freeze that separately. Hope that helps!! I make a similar cookie using either vanilla, almond or anise extract, depending on the taste you prefer…… but my recipe doesn’t have ricotta in it……..I will definitely try this recipe…i love the idea of the orange zest/vanilla. My question is how do you store the cookies? Do they need to be refrigerated (because of the heavy cream and ricotta) or can they keep in a tin at room temperature? Also, how long do they stay fresh. Can’t wait to try them. Yes, I would refrigerate them since ricotta seems to spoil pretty easily. Bring them to room temperature before enjoying them! I would eat them within a few days. How do you store them and for how long? Question, do these need refrigeration after making? 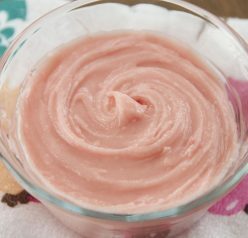 Does anyone know if this recipe can be halfed? yes it can be cut in half. Can this recipe be 1/2? Hi these cookies look amazing. Will be making today. Is the bottled zest stronger then the fresh? And if so is it a different measurment? Yes it is! I would Google it because I’m on vacation right now and can’t properly look the exact measurements up for you. Sorry about that! Good question, though! Can these be made with gluten free flour ? I haven’t tried that but it could work. Sorry! Hi there. I just made these today to bring up to my families to enjoy on Xmas day. Considering that’s in three days. How do you reccomend I keep these tasting as fresh as possible? Keep in fridge until Monday or freeze them? Thanks! Ps. They taste amazing! I would freeze them if you already Frosted them! Otherwise they tend to get soggy. Pattie, did you try the GF flour? If so how did they come out? Do you have half and half or whole milk? I made these today…they did not rise..baked in two batches and refrig the second batch to see if that you help…wonder what went wrong….they tasted great, but were like flat pancakes….Thanks. Not sure. I’ve had countless people message me that they came out perfectly. Sorry you had trouble! I made these for Christmas and they were delicious. My family doesn’t like very sweet cookies so they disappeared before I could make the glaze. However I only baked half of the dough. The rest is in the frig. I plan on making them again for New Years. Should I keep the dough in the frig or freezer until I bake them. Thanks for a wonderful cookie. I would freeze the dough so the cookies will be more fresh! Oh and I’m so glad you all loved them! Salted or unsalted butter for the glaze? Does it matter? Can’t wait to make them! I would use unsalted butter! But it doesn’t really matter that much. Awww thanks so much Linda! I’m so glad to hear it! These are one of my all time favorite cookies! I love the fact they Italian cookies generally are a nice treat, but not overly-sweet. Hi! I am from Romania, I would like to ask you un cup how many grams does it have? Thank you! It is about 140 grams. Thanks, Cristina! They are gorgeous ! Surely they do ! Thanks! I am not a fan of orange flavor in my baked goods or chocolate. How are they with lemon zest? Would they be better with just vanilla or maybe almond extract? I’m sure lemon would be great! I’ve made these several times and they are perfect every time. Thinking about using this recipe for my Italian wedding cookies, substituting pure anise oil instead of the orange flavoring. I’ll let you know if it works for me. The cookie is so moist you can’t resist it. They also freeze very well, with wax paper between layers.. I’ve caught my kids eating them right from the freezer. I didn’t have sprinkles so I just tinted the icing. Thank you! I wanted to know if I could freeze the dough and I appreciate your comment. It looks yummy, I Love it. Wow these came out great! My daughter and I made these as gifts for her teachers during teacher appreciation week. I love using ricotta in baked goods to cut down on the sweetness. So soft and decadent, i like it and i will make this as gift for my best friend on her birthday is comming soon . Thanks for sharing. This is perfect gift for my wife. I think that she is very like it because she is special like cookie. Thanks for your post sharing. Yummy, I make a few varieties of cookies, press cookies , rolled, sliced. All with a glaze, I’ve finally tried these. Sooo easy to make. Yield about 5 dozen..???? These are my favorite cookies ever!! Thanks for such a great recipe! These are such amazing cookies. Love what the ricotta does for the texture! I love these cookies! I will have to make some to share with my family this weekend. These are a perfect treat for the holidays! I love how soft and fluffy these look! These were a hit at the Senior Party and at home. 100% perfect cookies in taste, length of time they held up and how people liked them One family member who is avoiding food that is too sweet said these were just right. He did miss the anisette flavoring I usually use but liked these a lot. They are a softer more moist cookie not dry. I kept the tray I made for my daughter in the refrigerator for 5 days, covered with a paper towel and then foil so they did not sweat. They are just as soft at room temp as the day I made them, still soft and not dry at all. They are delicious cold too. Thank You and I am using this recipe for my Christmas cookies but as family likes anisette will use that. I really liked the orange flavor and put a tsp of orange flavoring in mine. I think that I may try mini choc. chips and orange too. This is a Delicious Cookie and I urge everyone to make it.. 5 Star for sure. More if possible. I just came across this recipe. Good timing for the holidays. I am looking forward to making them. My daughter-in-law is allergic to citrus so orange zest is out. I wonder if I should just leave it out or should I adjust the recipe in some way to compensate. Do you have a suggestion? Could I use less than 2 cups of sugar without compromising the taste? I haven’t tried that but imagine it would be yummy! These remind me of Jubilee Jumbles which was General Mills flour 25th anniversary cookie. Have made for 63 years but want to try this version with the ricotta. Thanks for the receipe. I am wondering if anyone ever added cocoa or chocolate to these? I will make the plain and I like the idea of mini chocolate chips–but I am also looking for a new “chocolate” cookie. Thank you! Or does it have to be baked once the dough is made? You can definitely make the dough ahead of time! Can you leave out the orange zest? When measuring the ricotta cheese, do you use a liquid measure or is the 15 ounces measured by weight? By weight! Thanks for asking! Ashley can you freeze these cookies once baked? Yes you can! Enjoy them! They are so moist, fluffy and tasty. Great holiday cookie. I have only a 3lb tub of ricotta, with no way to weigh out 15oz. Can you give a cup measurement equivalent to this? Thank you. Refrigerate or freeze the dough before baking? I am baking some today but I would like to take the rest the dough and put away to bake a day before Christmas which is just a little over a week away. I freeze the dough every year! They turned out fantastic. However I substituted lemon zest and lemon extract and they came out great. Everyone at work loved them. These came out fabulous! Just made a batch and my daughter and I are trying not to eat them all! They are so light and fluffy. The glaze is wonderful too. I had to adjust the liquid but ima happy camper here! Yummo! After cooling the cookies,I glaze them and then sprinkle wth color sprinkles . For some reason the sprinkles bleed and discolor is there a reason that this happens . Please answer because it’s really upsetting. I made them yesterday, I used Christmas red, green and white sprinkles. Prettiest cookie at the cookie exchange. I was nervous about the amount of zest (was using fresh) and only added 1 tablespoon, but I definitely could have used two tablespoons. With a 1-tablespoon cookie scoop the recipe yielded 7-dozen cookies which I think are nicely sized for holiday cookie plates. I did need to make a double batch of the glaze to top all of my cookies though. I wish you could see them, they are so pretty! Thank you! I’m so glad to hear this! Wish I could see! Can you refrigerate any remaining dough? Yes – just make sure you use it within a couple of days or freeze it. How should the cookies be stored to keep their softness? I’m so glad to hear this Shannin!